Ruthless Golf: Well, It's About Time! And what have we learned? We have learned that, if you want to run the World Golf Hall of Fame properly, you need to put legendary golfers in charge of it! Geoff Shackelford jokingly referred to the "right people" making the choices now -- a reference to a Golf Channel blog post on the topic -- but he won't complain about the Class of 2015. 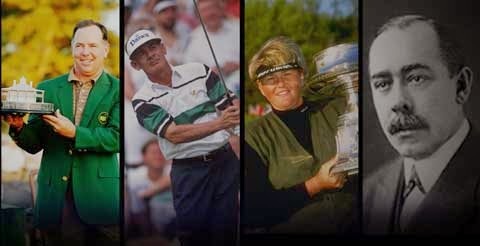 The four inductees include his two "most overlooked names" -- Laura Davies and A.W. Tillinghast -- as well as David Graham and Mark O’Meara, two other players he felt had been unfairly passed over. It's obvious that putting Nancy Lopez, Arnold Palmer, Gary Player, and Annika Sorenstam in charge of the Selection Committee was indeed the right choice. You can read the official press release from the WGHoF at this link (there are more links at the bottom of that page, including one to a transcript of the conference call with the three living inductees announcing the choices) but a few points about the inductees do bear mentioning. Tillinghast is considered one of the most influential golf course architects in history, having designed, revamped, or consulted on at least 265 courses, according to Wikipedia. Ever heard of Bethpage Black or Baltusrol? Those are just two of his creations. I believe something like 20 major championships have been held on his courses. As for the other two inductees, Mark O'Meara is the oldest player to win 2 majors in one year (the 1998 Masters and Open Championship) while David Graham is one of only 4 players to win events on 6 continents. (Hale Irwin, Bernhard Langer and Gary Player are the other three. To my knowledge, no one has won any event on Antarctica.) And both men have over 20 worldwide wins. On a personal note, I think one of the great weaknesses of the Hall in the past has been the way it minimized the importance of wins anywhere but in the USA. Perhaps the recent poundings Americans have taken at the Ryder Cup helped amend that error? At any rate, I'm glad to see the WORLD Golf Hall of Fame finally putting more value on worldwide wins. The official induction will be held at the University of St Andrews during the 2015 Open Championship at St. Andrews, the first time the Induction Ceremony has been held internationally. It's a fitting location for some past wrongs to be righted, don't you think?